9 December 2014. A review of insurance claims from 2009 to 2013 shows fewer Americans taking opioid pain medications, but for longer periods than originally prescribed and in potentially dangerous combinations. Results of the review were released today in a report by the pharmacy-benefit management company Express Scripts in St. Louis, and authored by Lynne Nowak, the company’s medical director. Opioids are medications that act by reducing the intensity of pain signals to areas of the brain controlling emotion, thus diminishing effects of the pain stimulus. Popular opioid drugs include hydrocodone (example: Vicodin), oxycodone (OxyContin and Percocet), morphine, and codeine, which can also be taken for colds and coughs. The company notes that the U.S. has about 5 percent of the world’s population, but consumes some 80 percent of the world’s opioid supply. Nowak and colleagues reviewed 36 million anonymized Express Scripts pharmacy insurance claims made by 6.8 million people in the U.S. between 2009 and 2013, who filled at least one prescription for an opioid pain reliever to treat either acute (short-term) or longer-term pain. Short-term users were defined as people who were prescribed opioid pain medications for 30 days or less in a 1-year period, while longer-term or chronic users are people receiving pain medication supplies of more than 30 days in a 1-year period. The findings show the number of people in the U.S. filling pain prescriptions dropped 9 percent between 2009 and 2013, particularly short-term pain drug users that declined 11 percent over that 5-year period. Short-term opioid users represent about 8 in 10 of people filling pain prescriptions. Nonetheless, the number of opioid pain prescriptions and number of days taking the medications rose by 8 percent from 2009 to 2013. The percentage of longer term pain medication users stayed stable over the 5-year study period. The authors estimate the number of number of people with health insurance in the U.S. taking opioids for more than 30 days in a year to number 9.4 million. In addition, about half of long-term opioid pain medication users continued to use the medications for 3 years or more. Moreover, nearly half (47%) of the people taking pain medications for longer periods, were using drugs normally prescribed for short-term, not long-term use. As a result, note the authors, these patients were at a higher risk of addiction. Chronic pain medication users filled on average 56 short-acting opioids over 3 years, almost 19 prescriptions per year. The researchers found nearly 6 in 10 (59%) using pain opioids are taking these medications in potentially dangerous combinations. Among these mixtures, nearly 3 in 10 (29%) of longer-term users have concurrent prescriptions for anti-anxiety drugs known as benzodiazepines as well as opioids. Nearly the same proportion (28%) are taking muscle relaxants, and 8 percent are taking all 3 kinds of medications. Opioids, muscle relaxants and benzodiazepines all act as sedatives, and can slow down the respiratory system. The authors note that the combination of benzodiazepines and opioids is the most common cause of overdose deaths involving multiple drugs. Women account for about two-thirds of people taking these potentially hazardous combinations. Use of opioids depends to some extent on the age of the patient. The highest proportion of opioid users are people age 65 and over; some 9 percent of that group in 2013 took pain medications. However, adults age 20 to 44 filled more opioid prescriptions — 10, on average — than people in other age categories. The number of days of medication per prescription also rose 10 percent between 2009 and 2013 for this age group. While women are more likely than men to take opioids for pain, men are more likely to fill more prescriptions and take higher doses. Of the 25 cities with the greatest number of longer-term opioid users, 24 of those cities have populations of 100,000 or fewer. In addition, the researchers found the vast majority of these cities were located in Kentucky, Alabama, Georgia, and Arkansas. 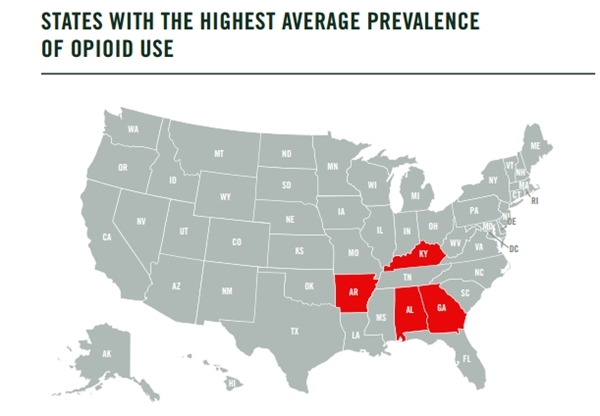 These states claim 41 of the 50 cities with the highest prevalence of opioid use in the country.